We all heard people, during the dot-com era, bypass tried and true business concepts to champion untried--and untrue--concepts such as 'The Internet changes everything' and 'The company with first mover advantage wins.' While there is some truth to these concepts (and I think we will learn where to apply them correctly) the problem was that they were built on beliefs that the old rules--the law of gravity, for instance--no longer applied. We all know, however, that the law of gravity does in fact still apply. And like the law of gravity, the Law of Momentum is one of the most important laws for your product. The Law of Momentum basically states that you can push a thing to make it go faster, and that as a thing builds up speed, it's easier to make it go even faster. One of the top jobs of a Product Manager--and I've never seen it on a job description--is to make the product gain momentum. When you make it gain momentum, it catches up to competitors that were ahead, and eventually pulls ahead of the pack. Leading to a more profitable product and a more successful company. And once you've got the momentum, you don't have to work so hard to increase your speed. Read on for tips on how to build momentum for your product. The book Good to Great: Why Some Companies Make the Leap ... and Others Don't by Jim Collins (HarperCollins, 2001) analyzes companies that went from being good companies to being extremely successful and determines the factors that led to their transformation. One of the conclusions in the book is that there is no silver bullet that makes a company suddenly pick up momentum. It compares the effort to pushing a really big, heavy wheel. At first, it requires lots of pushing just to get the wheel to budge at all. Then, very gradually, the wheel starts moving faster and faster. Our focus here is pushing on the big wheel that is our product in order to get it moving, and then moving faster. It's a lot of hard work. The first thing to understand is that building momentum is a cumulative thing. It comes from adding up momentum in such things as launching new features, marketing success, and customer success stories. Momentum in each area can be used to feed the overall momentum. This is the equivalent of the need to expend a lot of effort to push on that big wheel. 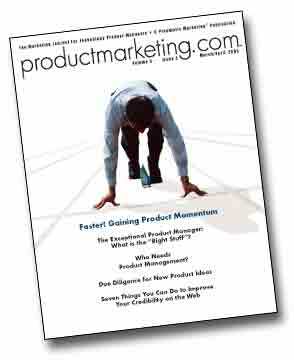 There isn't just one thing you can focus on to gain product momentum. It's the result of sustained hard work on many fronts. The most noticeable momentum that you can gain relative to competitors is feature momentum. This is where you can develop more new features--and better versions of features that your competitors are working on--in the same amount of time. To increase the pace at which you develop new features, you need to rely on a structured process to: 1) identify and define competitive features, and 2) design, code, and test these features. The more you can structure your product research, requirements development, and prioritization of new features, the better you can focus existing development resources on developing the features you choose. One way to focus developers on developing--as opposed to investigating and speculating--is to provide requirements that are factual and provide broad instructions while also making the major judgment calls that let a software developer focus not on what a feature must do, but on how to make it work. By reviewing your requirements with the developers assigned to create designs from them, and learning what the major decisions are that must be made, you can indicate some of the decisions up front in the requirements. For example: 'Provide ability to export Customer records for merge mailings' is a decent first start. But it's probably worth specifying that you want to export them to 'comma delimited files containing the specific fields selected from a list of all potential fields in the customer record.' It saves you a lot of back and forth, plus it prevents a programmer from possibly thinking they need to develop something that exports into a complex data format. At this point, it's helpful to discuss something I call 'feature fatigue' which happens when your development team can crank out features faster than the consultants and trainers at your company, not to mention your existing customers, can absorb them. It isn't enough to speed things up in only one area. Good momentum requires progress on all fronts, or else the organization as a whole gets worn out trying to keep up with the part that has gained speed. For example, you want to ensure that Marketing is building up the momentum to take advantage of your feature momentum, or any other momentum. If you stagnate on any one front, you may find it creates a drag on the momentum you worked so hard to build somewhere else. Release momentum has two aspects. The first is the ability of Development to package and release new features. The second is the ability of your company as a whole to receive the output of your software development engine and launch it to the market. Here is where a structured and predictable release cycle is extremely helpful. Using tactics such as release and phase dates on a fixed schedule, with the same structure and timeframes for each release, Development can focus on production, rather than spending time wrestling with setting schedules and switching gears due to unexpected deadline changes. This is also where a cross functional team that prepares for every launch can coordinate all the efforts needed for a smooth launch, both internal and external. Make sure that the product launch team truly includes all individuals needed for an unimpeded launch. Did you think about including Accounts Payable, so they know exactly how to bill for upgrades and new modules? For some reason, people keep forgetting the teammates whose job it is to make sure your company actually gets paid for what it sells. Marketing momentum increases when you time your output of collateral and sales tools to hit right at product launch, not to lag the availability of the features by weeks or months. But marketing momentum goes far beyond that. Ideally, by the time new features hit the market officially, your Marketing department has already presented case studies to analysts and to the press. When it comes to press coverage, it's important to remember to go back to the publications that have covered you already. I think the tendency is to try to hit as wide a number of publications and channels as possible. While that is a good thing, it's easy to forget that you already have some momentum going with the places where you have gotten coverage before. In this case, you get more speed by pushing a wheel that was already moving. Finally, by creating a series of coordinated campaigns that build upon or complement each other, rather than carrying out isolated campaigns that don't work together, you get more marketing motion. Don't spin the wheel once and let it come to a stop, only to find you have to expend the exact same effort as before just to get the wheel to go another turn. Craft messages and creative materials that build upon what went before. With all your effort, the first campaign probably does nothing more than open the door. The second campaign gets you noticed. The third actually grabs the prospect's attention. So for the same amount of effort with each ensuing campaign, you get bigger results. Sales momentum builds off marketing momentum and feeds customer momentum, described below. One good way to maximize sales momentum is to make sure as the Product Manager that you train the sales force fully on all sales tools developed for them. Another way a Product Manager can support sales momentum is through consistent support, tailored to the various reps' differences. For instance, for some reps you want to make sure you're a great resource for competitive information. For others, the best help from you could be setting up and running demos. Of course, it's the VP of Sales who can have the most impact on momentum. But by coordinating your efforts with the sales managers, you add to the speed. Partner momentum is probably the slowest to build. Partner momentum adds to all your marketing efforts, and in fact may make the difference between a good return and no return on a marketing campaign. Partner momentum benefits from a structured review process that regularly reviews each partner effort and measures the return. It's better to consider marketing and sales efforts separately. By creating marketing campaigns that feed leads to partners, and publicizing the leads and a partner's success with them, you create a lot of momentum among the partner's sales force. Working with a larger company as a partner adds momentum to your marketing campaigns, because you have more 'feet on the street' to follow up on leads. Customer momentum comes from customers experiencing good returns on their investment in your product. This leads to stories that get notice in the press, because they're real-world stories rather than simple marketing promotion. One satisfied customer can lead to other satisfied customers through a defined reference program that rewards customers who serve as references with prospects or the media. Finally, employee momentum may be one of the least noticed, but it feeds all the others. Employee momentum is where employees begin to work smarter, and work more collaboratively, and produce more as a team than as individuals added together. Ways to build employee momentum include general efforts such as empowerment and training in teamwork skills. Also included are more specific initiatives to train staff in common processes and build teams that work to common goals using common tools. Don't Get Even, Get Ahead! By increasing the product momentum, you can watch your product--and your company--pull even with competitors who outpaced you before, and then pull ahead of the pack.